Pay-per-click (PPC) Advertising generates massive amounts of trackable data that can be analyzed to find areas of weakness, strength, loss and growth opportunities for online marketing campaigns. Being able to translate this data into strategic PPC management decisions that improve account performance is what fuels search engine marketing. The diversity of this data is one of the major luxuries of advertising in a digital world. It allows you to prove the value of your PPC with concrete numbers, but it can also cause you to lose focus on the big picture; pay-per-click advertising is still advertising. Pay-per-click Advertising, like the majority of advertising avenues, cannot always be quantified to determine its effectiveness. It can appear that the reach of a PPC accounts is tracked, but the data doesn’t always portray true value. In one of my past blog posts I evaluated the validity of view-through conversions and the impact an un-clicked image ad has on end sales. It was interesting to find that although the image ad wasn’t clicked, it did positively influence end sales, meaning that the ads contribute to more than just the number of clicks it receives. Ads have an emotional impact on our customers, and that’s incredibly hard to quantify. TV commercials have been trying to find a trackable solution to this problem since the first commercial aired in 1941. Cross-device tracking is another area that doesn’t accurately represent what PPC brings to the table. I myself have seven different devices in which I can access the internet. I also have an unknown number of different email addresses and logins I use (I think there’s still a MySpace page floating around from my awkward teen years.) It would be really hard to determine my path to purchase based on all the different routes I can take to get there. I know that there’s a large effort to help improve cross-device reporting, but for now, it doesn’t come close to representing what’s actually occurring. Why is it that TV commercials, radio advertising and highway billboards are not dissected by hard-nosed reporting? Why are there not reports determining the cost effectiveness of these ads and the exact number of sales each platform is responsible for? It is universally understood that these forms of advertising provide additional value beyond the few customers who might mention the ad for a discount. PPC is viewed exactly the opposite. The worth of an account is often weighted too heavily on the numbers that a PPC campaign reports. It’s often denied the opulence of acknowledgement for the additional persuasion it delivers. 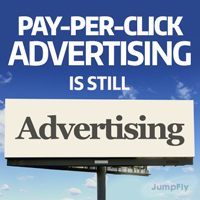 We need to understand that PPC is more than the by-the-numbers stigma it is often granted. It’s a form of advertising, which by definition, is to “draw attention to (a product, service, or event).” PPC advertising is not a cold, unemotional math equation that always has a right or wrong answer; it’s still just advertising. 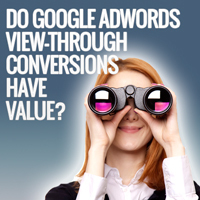 Do Google AdWords View-Through Conversions Have Value? Before we start dissecting Google AdWords View-through Conversions and their role in AdWords management, let’s first get a basic understanding of what a View-Through conversion is: A View-Through Conversion (VTC) occurs when an image or rich media ad is shown to an individual who ends up completing a conversionary action on your site without ever clicking on an image or rich media ad prior to the conversion. The window in which a View-Through Conversion can be recorded is defaulted to 30 days, but you can decrease the window to coincide with your marketing goals. Here’s a real-life example of a View-Through Conversion: you’re on Forbes.com and you see an image ad for sporting equipment. You decide not to click on the ad, and continue browsing on Forbes.com. The next day, you end up visiting and making a purchase from the site that had displayed the sporting equipment ad to you on Forbes.com. This counts as a VTC because you saw, but did not click, on the image ad that was shown. It does not matter how you ended up getting to the site, whether organically, directly typing in the URL or even clicking on a search engine-based ad, as long as you didn’t click on an image or rich media ad and converted within the VTC window, it will count as a VTC. The value of a View-Through Conversion is widely debated in the internet marketing world. Questions arise pertaining to the effect an unclicked image or rich media has on customer’s conversion path. Had the ad not been there, would they have gone to the website and converted anyway? Since they did not click on the ad, did they not like it? Did they even see it? Was the last click conversion purely a coincidence or did the ad play a pivotal role in the path towards a conversion? Unfortunately, we don’t have a definitive answer to these questions without the solution to the chaos theory or Doc Brown’s time-traveling DeLorean. What we do have is lots and lots of data that can be analyzed to find trends in Google’s Display Network View-Through Conversion behavior. There were many ways to approach our data in hopes to find behavioral spikes in VTCs; I chose to focus on the size of an image ad and the correlation it had on their conversion rates and the corresponding VTC rates. I used data from seven ecommerce-based businesses, where the conversionary action is the purchase of a physical product, then segmented the data for three different ad sizes; 160×600, 728×90 and 300×250. I only included data from ad groups that had all three sizes and used the same ad theme for each size to avoid favoritism in ad copy style. By analyzing the data one thing becomes apparent: View-through Conversions do matter. The data reveals VTC rates and regular conversion rates follow the same trend line when segmented by ad size. If the conversion rates were higher for a particular ad size, then the VTC rates were also higher. This means VTCs are not random in relation to ad size. The greater the conversion rate, the greater the View-through Conversion rate. Without acknowledging the plentiful uncontrolled variables, and there are many, we’ve determined that view-through conversions are not completely bogus. The data may be raw but it cannot be ignored. As time progresses and technology advances we will be able to obtain more concrete data (e.g. http://adwords.blogspot.com/2013/06/see-full-impact-of-unclicked-display.html.) Until then, we will have to be satisfied that we answered at least one of the many VTC-orientated questions; does an unclicked ad have an effect on the path to a conversion? Yes. As Nikki noted in an earlier post, Google recently announced a new AdWords campaign format, called Enhanced Campaigns. There are an array of new features with this update but the principle idea behind this structural change is to help simplify the increasingly dynamic device and location-based targeting at Google AdWords. The feature that I find most intriguing is the capability of adding bid multipliers to a campaign based on the physical location of a search. While the foundation of location targeting will remain the same, such as targeting and excluding locations, we now have the ability to bid more or less on a physical location or distance from a location, such as a business address. Google’s addition of bid multipliers using location-based segments is a great addition to the AdWords program. The ability for advertisers to decide how aggressively they would like to target consumers based on physical location, adds a whole new dimension to geographic targeting. With Location-Based Bid Multipliers, a brick-and-mortar business, whose customer base is strictly local, can add a 150% bid multiplier for searches within a five mile radius from their store and a bid decrease for anyone who is located beyond 15 miles but still within a 30 mile radius. The idea behind this strategy is that not all consumers have an equal chance of converting. For many businesses, the location of a potential customer is the biggest component in the conversion equation and needs to be taken into account for effective PPC Management. This advanced bidding feature is also incredibly valuable for an eCommerce business. Often times, eCommerce advertisers have large quantities of campaigns targeting an entire country. Although they do not perform equally in all locations, the idea of having to split out hundreds of campaigns to target every state, or even specific cities, can be overwhelming and extremely time consuming. Even if campaigns were eventually split, being left with tens of thousands of campaigns, it would be more difficult to manage effectively. 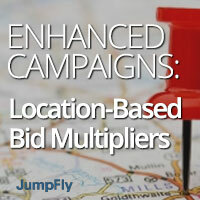 Keeping campaigns consolidated while being able to add bid multipliers to specific locations based on performance is a far more efficient alternative. The addition of Enhanced Campaigns is a big move for Google and it’s going to be an interesting journey to see how these features impact ad performance. While there are a few features that I do not agree with, bid multipliers for location targeting is one I am very excited about.